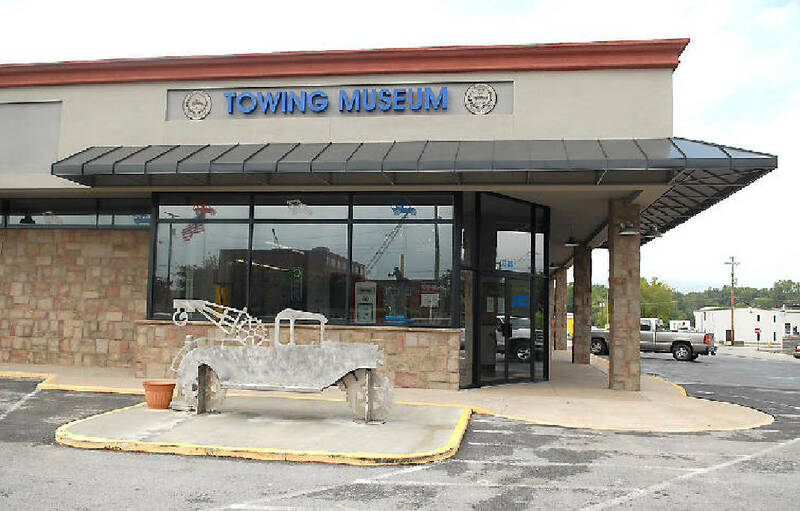 The International Towing and Recovery Hall of Fame and Museum is located on South Broad Street in Chattanooga. The tow truck was invented in Chattanooga, The International Towing & Recovery Hall of Fame and Museum is here and Ooltewah is home to Miller Industries, the world's largest manufacturer of towing and recovery equipment. So, yeah, there will be a celebration in Chattanooga on Saturday, Sept. 10, to mark the tow truck's 100th birthday. Miller Industries will sponsor the festivities, which include a parade of tow trucks rolling through downtown that will stop around 7 p.m. Saturday at Ross's Landing near the Tennessee River riverfront. The public is invited to Ross's Landing for live music, free refreshments, food truck fare, games for kids — and a fireworks display once it gets dark. Lots of people are expected for the once-in-a-century event. "Since I've come to work here, I have been amazed at how many people are actually into tow trucks. It is mind-boggling," said Kathy Brown, who worked at a bank downtown before she was hired in mid-August as co-assistant director at the International Towing & Recovery Hall of Fame and Museum. "I did not realize tow trucks had such a following." The museum's events will include a ceremony at 10 a.m. on Sept. 10 that's open to the public, to add names to the museum's Wall of the Fallen, a memorial to tow truck operators who've lost their lives on the job. The museum also has a survivor's fund that helps drivers' families, Brown said. TV shows about the towing and recovery industry are popular, including "Highway Thru Hell," a reality TV show set in Canada, "Wrecked," set in Chicago, and "Ice Road Truckers." Jamie Davis, a real-life tow truck operator who's the star of "Highway Thru Hell," will take part in Saturday's parade. The 100th birthday celebration coincides with the Tennessee Tow Show, which runs from Thursday to Saturday at the Chattanooga Convention Center. "There'll probably be over 2,000 people this year, because it's the 100th anniversary," said Jimmy Collins, president of the Tennessee Tow Truck Association and owner of Casper's Bodyshop and Wrecker in Greeneville, Tenn. "For the industry [the anniversary's] a big milestone. For the city of Chattanooga, it's a big milestone." Ernest Holmes in 1916 built the first tow truck in Chattanooga by attaching a rigging system to a 1913 Cadillac, marking the birth of the towing and recovery industry, according to Miller Industries. Holmes filed for a patent — the first of about a dozen — for his idea in 1917 and subsequently built the Ernest Holmes Co. here to make and market his tow truck. The Holmes brand lives on as part of Miller Industries' family of tow truck equipment manufacturers that also includes the brands Century, Chevron, Vulcan, Boniface and Jige. "Miller Industries' roots run deep in Chattanooga, and we are honored to share the centennial celebration of our Holmes brand with our friends and neighbors in the local communities," Miller Industries' President and Co-CEO Will Miller said in a statement.